Living it easy on the California Delta...you gotta love Cajun Zydeco Music! Join us sometime for a good time with friends and family. 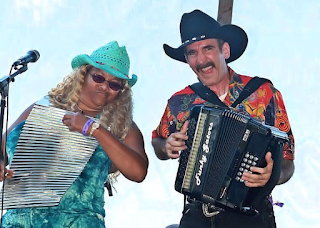 We will have our next Cajun/Zydeco afternoon dance at the Veterans of Foreign Wars Post #8762, 905 Drever St. West Sacramento on Sunday Feb 17,2019 from 3:00 til 6:30 PM, featuring C Z and the Bon Vivants for your listening and dancing pleasure. Cover charge at the door is $15.00 per person. Buddy and Barbara will be there at 2:00 pm to open the doors, so please come early so you can choose where you would like to sit. Contact Buddy Linker at 916-371-6303 or 916-718-4175 for info. Complimentary dance lessons by Ted Sherrod at 2:30 PM. Jo Ann Sherrod will be making some delicious food that will be made available for purchase. 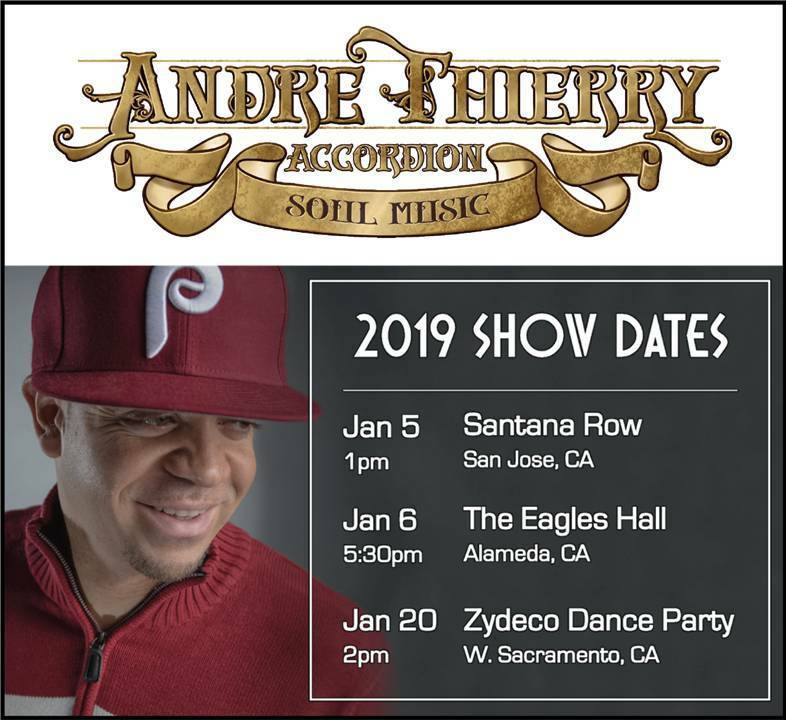 Join us for a very special Cajun/Zydeco afternoon dance on January 20, 2019 featuring Andre Thierry and Zydeco Magic, at Veterans of Foreign Wars Post #8762, 905 Drever St. West Sacramento. Cover charge is $15.00 per person. Please come early so you can chose where you would like to sit. Buddy and I will be there at 2:00 pm to open the doors. Contact Buddy Linker at 916-371-6303 or 916-718-4175 for info. 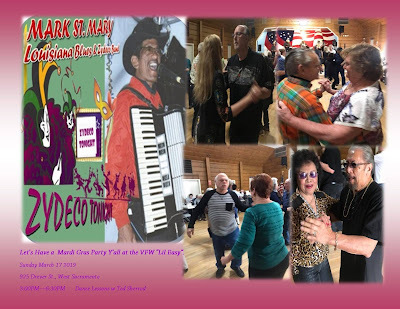 We will have our Cajun/Zydeco afternoon dance at the Veterans of Foreign Wars Post #8762, 905 Drever St. West Sacramento. Featuring music for your listening and dancing pleasure, Sunday Dec.16, 2018 from 3:00 pm til 6:30 P.M. The Bayou Boys Cover charge is $15.00 per person. Please come early so you can chose where you would like to sit. Buddy and I will be there at 2:00 pm to open the doors. Contact Buddy Linker at 916-371-6303 or 916-718-4175 for info. Jo Ann Sherrod will be making some delicious food that will be made available for purchase. 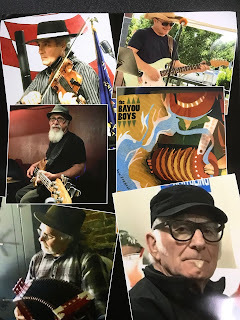 Featuring music for your listening and dancing pleasure, Blues Box Bayou Band will there to kick off our new season on Sunday September 16, 2018 from 3:00 pm til 6:30 PM at the Veterans of Foreign Wars Post #8762, 905 Drever St. West Sacramento. We will have our last Cajun/Zydeco afternoon dance for this season at the Veterans of Foreign Wars Post #8762, 905 Drever St. West Sacramento. Featuring music for your listening and dancing pleasure on Sunday May 20, 2018 from 3:00 pm til 6:30 pm, "Funky Gators" Cover charge is $15.00 per person. Buddy and I will be there at 2:00 pm to open the doors. For information contact Buddy Linker at 916-371-6303 or 916-718-4175 . Food will be made available for purchase. 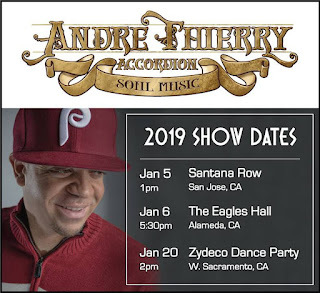 Dance lesson included in cover charge Zydeco Dance Party 2:30 Zydeco Lesson/Ted Sherrod.